Find and investigate the source of a love letter from Gadayn Andarys to Eraldil. Find a love letter in the southern planter on the Hlaalu Canton Plaza. Decide how to handle the situation; Trick, or True Love? Return after ten days for your reward. If you are very thorough, or lucky, you might have found a love letter in the southern planter on the Hlaalu Canton Plaza. The letter is from Gadayn Andarys to Eraldil and should be a good example of how not to write a love letter. You can find Andarys close by in his General Goods shop on the same level. It seems that, although eloquent, Andarys simply cannot profess his profound feelings to Eraldil, and asks you to act on his behalf. You can find Eraldil walking around on the Hlaalu Canton Waistworks level who will outright reject Andarys' profession of love, being rather rude in the process, suggesting that he marry her cousin instead. Return to Andarys with the bad news, though he takes it rather well, suggesting instead that you use a love potion to convince Eraldil. You can either agree to use the potion, or bring up the suggestion about her cousin, Glathel. If you suggest her cousin, Andarys will have a sudden change of heart, agreeing that Glathel would be a good choice. If you return to Andarys again ten days later, he and Glathel will have married and he is quite happy. So happy, in fact, that he will reward you with a Flamemirror Robe and cheap prices at his store. On the other hand, if you do agree to use the potion, bring it to Eraldil, pretending that Andarys is sending it as an apology. Eraldil accepts it with her usual rude remarks. Return once again to Andarys who is still optimistic and gives you a Light Ring as a reward. If you return to him after ten days have passed, they will now be married. However Gadayn's mood lowers greatly and he blames it mostly on you, raising his prices to boot. 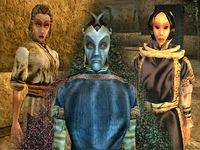 Mavon Drenim owns a second Flamemirror Robe, and a third is added by Tribunal; it is worn by Gavis Velas. The cheap prices are achieved by lowering Andarys' Mercantile skill by a total of 80 points and increasing his disposition by a total of 50 points. If he ends up marrying Eraldil, however, his mercantile increases by 50 instead and his disposition drops by 20. 10 I've spoken to Gadayn Andarys about the note of his I found on the ground. He tells me that he has been in love with Eraldil for many months, but has not had the courage to tell her. He would like me to speak to her and tell her of his love. 20 I have agreed to speak with Eraldil about Gadayn. He suggested I might find her in the Hlaalu Waistworks. 30 Finishes quest I've decided not to get involved with Gadayn and his love for Eraldil. 40 I've talked to Eraldil about Gadayn Andarys and his love for her, and the response was not positive. She detests the poor trader, and wants nothing to do with him. She sees him as much too common for herself, and more fitting for someone like her lowly cousin, Glathel. 50 Gadayn Andarys was heartbroken by the news that Eraldil wanted no part in his affections, but has been ready for this eventuality. 60 Gadayn has had a potion crafted that will cause the wood elf [sic] to fall madly in love with him. He would like me to deliver it to him [sic]. 70 I have agreed to deliver the love potion to Eraldil. 80 I decided not to deliver the potion to Eraldil, but instead suggested to Gadayn that he might consider turning his attentions to Glathel. Gadayn seems open to the idea. 90 Eraldil has accepted the potion from Gadayn, thinking it is his way of apologizing for his behavior. 95 I have told Gadayn about delivering the potion, and he was overjoyed. He gave me a light ring as a token of his thanks. 100 Finishes quest I have returned to Gadayn's shop, and it seems the love potion has not worked out as planned. Eraldil has fallen in love with him, but he is unhappier than he could have imagined. He finds the wood elf [sic] annoying, clinging, and vapid. A shame for the trader, but he got what he wished for. 110 Finishes quest Upon returning to Gadayn's shop, it appears he took my advice and courted the homely Glathel. The trader seems truly happy with the woman, and expressed his deepest gratitude. He also rewarded me with a Flamemirror Robe.